for multigenerational gatherings. 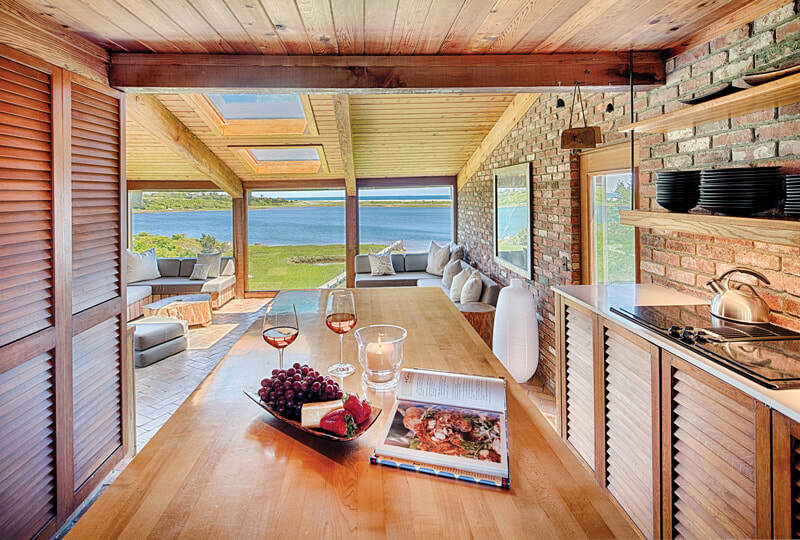 The seven-bedroom property effortlessly accommodates large gatherings but also offers quiet corners for relaxation. 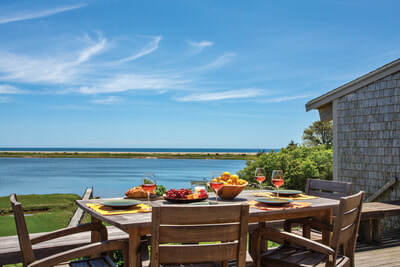 Water view decks at each home invite casual daytime meals and romantic evening dinners. From here the owners often observe a magical “double moon” when moonlight is reflected in both the pond and the ocean. There are two main houses, named in honor of well known past owners, and a pond side boathouse converted to living space. The first house is Lorca, a three-bedroom, two-bath house built in 1939 with views of both ponds and once owned by Francisco Garcia Lorca, brother of Spanish playwright and poet Federico Garcia Lorca. Francisco wrote most of his memoir of his brother, In the Green Morning: Memories of Federico, while summering here. 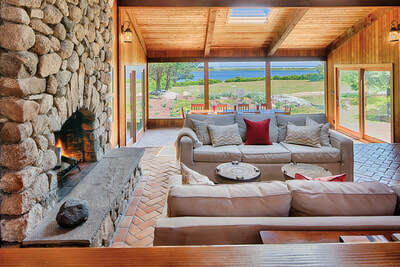 Francisco and his wife first visited the Vineyard in 1959 and purchased this house in 1960. 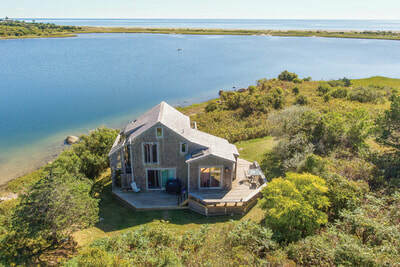 In 1973 the home was expanded by the current owners and has continually been upgraded but retains its cottage charm. 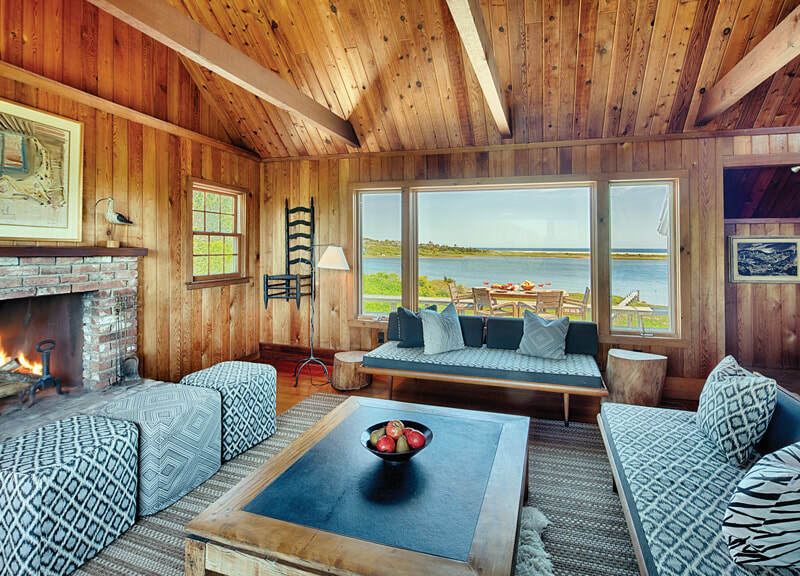 The vaulted ceiling family room welcomes evenings in front of the fire. There is a full bath off this room. 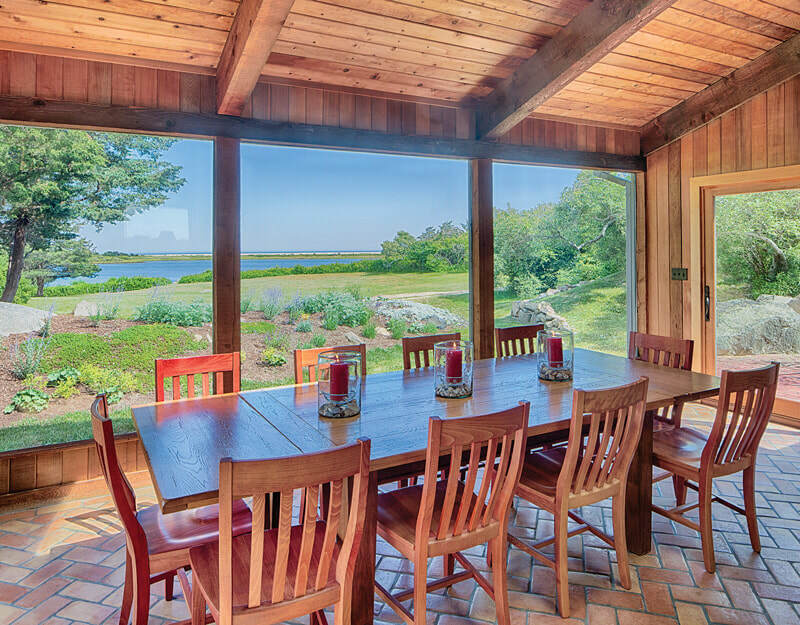 The well-equipped kitchen is open to the Stonewall Pond-side living room and has open shelving, a wall of brick that extends to the living room and a breakfast bar. The adjacent dining room overlooks Quitsa Pond. A first floor master suite has built-in shelving, sliders to the deck and a brick accented bathroom with sunken tub. 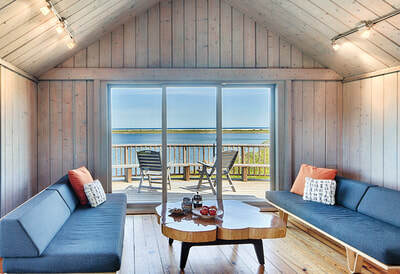 The second floor features two bedrooms with pond views and steps out to an observation deck with a stunning 360-degree view, perfect for cocktails as the sun sets, the owner says. 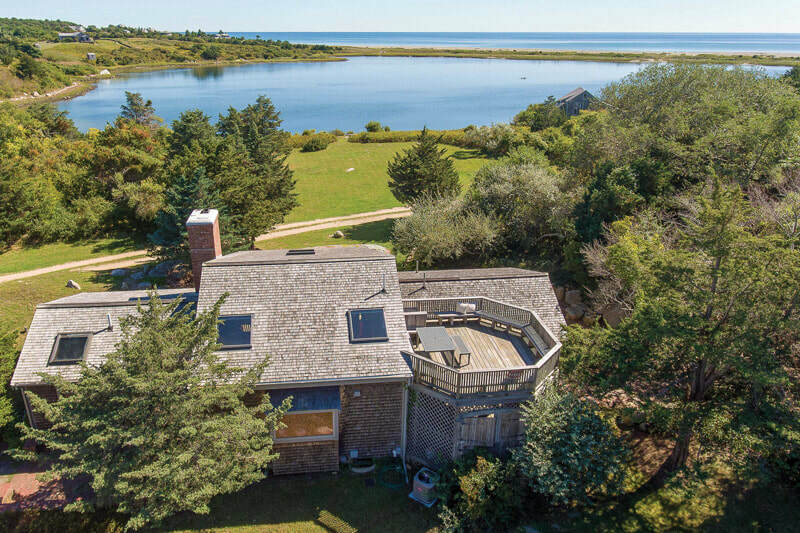 The garden slopes down to a dock that can accommodate small motorboats, kayaks or sailboats that can be sailed in the pond. 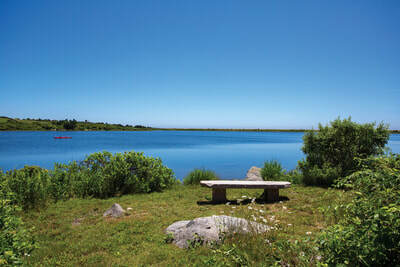 One can motor further -- under Hariph’s Creek Bridge to Quitsa and Menemsha ponds and on out to Vineyard Sound. Downhill is a home that is named for Clément and Mary Lenom. He was an oboist with the Boston Symphony from 1901-1925 who also conducted the Boston Pops and taught at the New England Conservatory of Music. His wife Mary was also a music instructor and they spent many summers and autumns at their Vineyard home. They bought their home in 1953 and the following year added a bedroom and bathroom. It was expanded again by the current owners in 1988 and upgraded most recently in 2017. 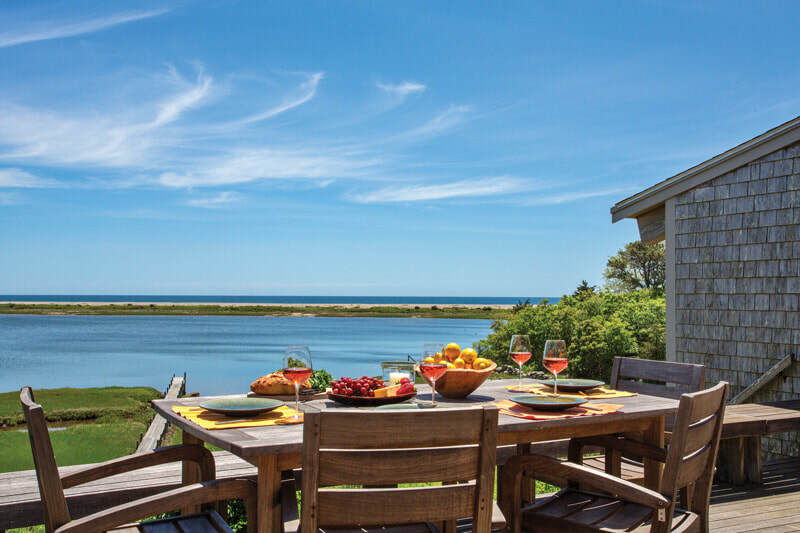 The open floor plan at Lenom allows views to both ponds from the eat-in kitchen and views of Stonewall Pond and the ocean from the great room. 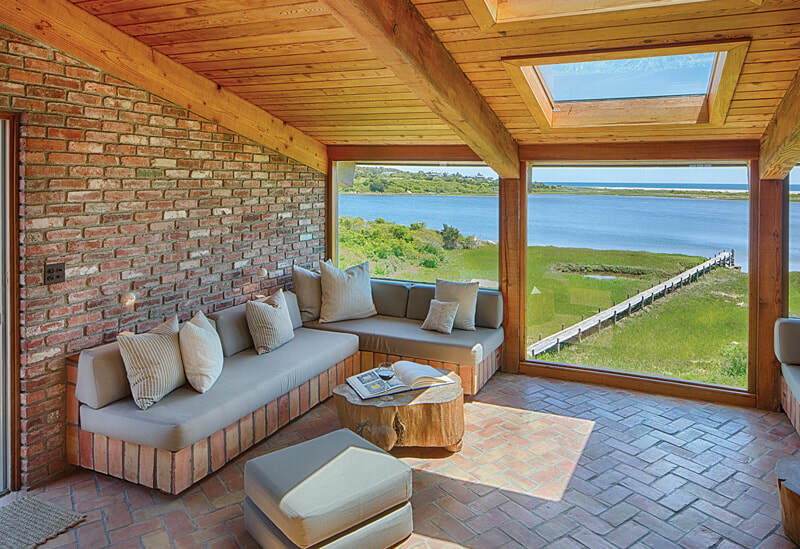 A massive stone fireplace and sliders from the dining room to the deck make this warm and inviting at any time of year. 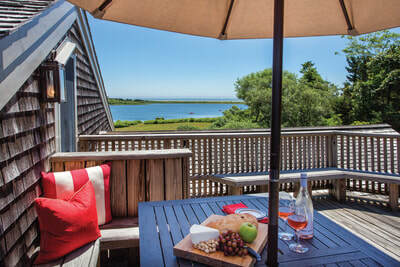 The current owners often take advantage of the quiet season on the Vineyard to enjoy this home. 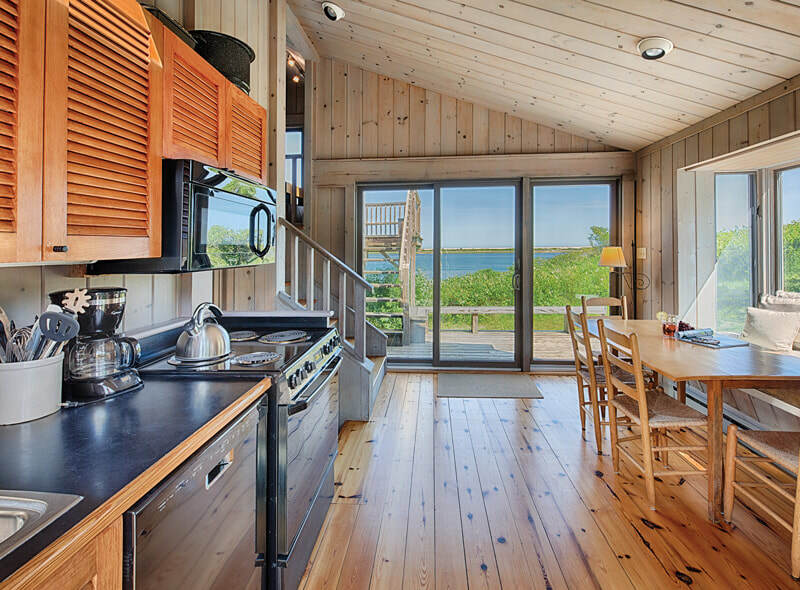 Wood paneling and Saltillo tile floors add to the carefree beachside feel. There are two bedrooms and two baths to the right. The private master suite with en suite bath on the left has its own deck with a pond and ocean view. Ancient boulders surround the stone patio off the living room. A second floor loft sitting room opens to a rooftop deck with views of Quitsa Pond, Stonewall Pond and the Atlantic. Recent renovations include an updated kitchen with laundry and air conditioning. At pond side is the small cottage that started life as a boathouse in the 1970s; the owner remembers sleeping among the boats as a child in what is now a bedroom, while his parents slept in the third floor loft. 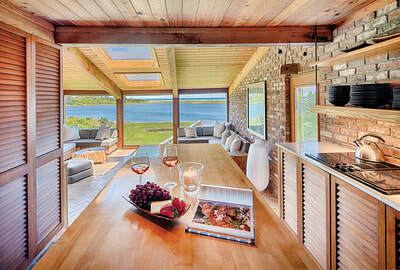 In between is a kitchen with dining area, bathroom and living room with a high deck overlooking the water. Because it is perched over Stonewall Pond where you could not build today it offers a unique experience very close to nature and unbelievable views. The owners turned it into a real house because the family loved living there so much. ​ From the first and second floors of all three houses the owners observe great white herons, cormorants, ospreys and a variety of other birds. Native evergreens obscure neighboring properties and give all three structures privacy. 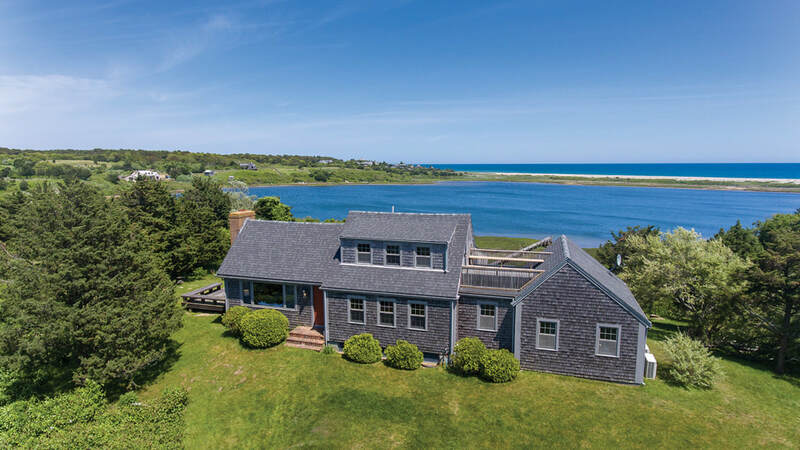 “With water views in two directions, we just watch the weather come in and out and watch the ever changing patterns of waves and light,” the owner says. or $5,500,000 for Lorca, 140 State Road, 1.2 acres.